E. J. and his sister Pearl. Photo courtesy of the author’s personal collection. E. J.’s draft card. 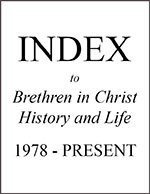 Courtesy of Brethren in Christ Historical Library and Archives. E. J. as a young man, 1917. Photo courtesy of the author’s personal collection. E. J. and his family experienced anxiety about what lay ahead. He and his father had read a newspaper report that described conscientious objectors who were maltreated by unauthorized men in the army. Some were held under a cold-water pump in the winter which resulted in their deaths from exposure. The next morning, Isaac took the morning train to seek current information that might be of help to E. J. He contacted Mennonite Bishop, Samuel F. (S. F.) Coffman and Brethren in Christ minister, David W. (D. W.) Heise.5 He was aware that Coffman and Heise, along with the Non-resistant Relief Organization, were working to achieve exemptions from military service for conscientious objectors. Specifically, they were now working hard on E. J.’s case.6 Representatives of the organization had already been to Ottawa to meet with government leaders about giving exemptions to Mennonite and Brethren in Christ draftees. However, in Isaac’s discussions with Coffman and Heise, he learned that despite their constant efforts, there was currently nothing that could be done for E. J. The Isaac Swalm home and farm. Photo courtesy of Brethren in Christ Historical Library and Archives. I would far rather get word that you were shot—that I should never see you again after you leave home—than to have you come home again, knowing that you compromised and failed to live up to the convictions that you had. Though it would be very hard for me to lose my son, and it would mean a lot, I’d rather know that you honored your convictions if it cost you your life, and I must spend the rest of my days without you. After a time of prayer in the granary, E. J. came to peace about his decision to stand for his beliefs. In the days before his departure, E. J. gave his possessions to various loved ones. When he left home, he did not expect to return. In a few days, E. J. was ordered to appear at the quartermaster’s to receive his army uniform and kit, which he immediately refused to accept. The quartermaster responded with threatening and obscene language. A corporal carried E. J.’s uniform and kit and escorted him to the bunk house where he was ordered to put on the uniform. Again, E. J. refused. He was stripped of his civilian clothes after which an army fatigue suit was put on him. He was immediately arrested and taken to the guard house where, to his surprise and delight, he met eight other Christian conscientious objectors, representing various Protestant denominations. The next morning E. J. and two other “objectors” were taken to Colonel Belson for a preliminary hearing. Belson declared he “would shoot every one of them if he had the authority.” He continued, “I suppose you have some Scripture for that [position].” E. J. replied that he “considered Saul of Tarsus, as he held the clothes of those [who] stoned Stephen [to be] a non-combatant. We don’t read that he threw any stones but he was thoroughly guilty of the crime because he was consenting unto his death.” E. J. continued, “For this reason, [I] could not take any part of it, whether it be stretcher bearer, whether it be making munitions, or what. [I] would just be releasing another man to shoot the bullets and to take life.” The colonel responded by remanding E. J. and the other two men for a district court-martial, to take place in a month. In a few weeks, the battalion, including the conscientious objectors, was moved to Camp Niagara in the town of Niagara-on-the-Lake. There the COs experienced many threats and much taunting. At one point some soldiers said that arrangements had been made to have E. J. shot. To confirm this, the same soldiers took a paper from a file and read out loud (falsely) that ammunition had been purchased for his execution. When this came to the attention of a Sergeant Hartley, the men involved were stopped. E. J. noted that Hartley and some of the other officers “were some of the finest gentlemen” he had ever met. Inoculation at Old Navy Hall at Camp Niagara. Photo courtesy of the Niagara Falls (Ontario) Public Library. The day of the court-martial came.While waiting outside of the court-martial tent, E.J. experienced a period of high anxiety. He prayed that his thoughts of despair would be taken from him. When he looked up, he saw Elder D. W. Heise from Gormley, Ontario (north of Toronto), walking toward him. Heise said that he had read about the upcoming court-martial in the Toronto Globethe previous day. Knowing that Isaac Swalm couldn’t be present, Heise left home at three o’clock in the morning, walked three miles to Toronto and took the first boat to Niagara-on-the Lake, arriving just five minutes before the court-martial. E. J. was overwhelmed by Heise’s kindness and support. Heise accompanied him into the tent, where E. J. was tried as a conscientious objector, as a defaulter, and for disobeying a lawful command given by a superior officer (refusing to put on uniform when ordered). He pled guilty. Heise was allowed to testify to E. J.’s character, but to no avail. All nine COs were charged with the same crime and all were sentenced to two years hard labor. Just prior to leaving the camp, the COs sang several hymns outside the guard house. 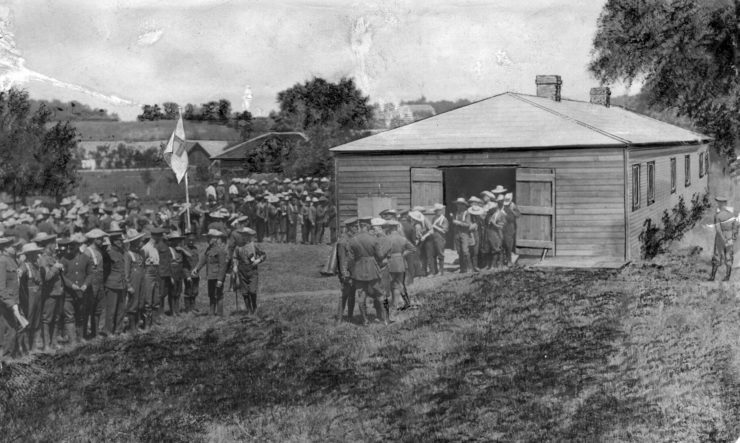 So many soldiers gathered to listen that “military police stood in between the [COs] and the [soldiers].” E. J. noted that “[S]cores of deeply-moved soldiers wept out of sympathy for [the COs] and because of the spiritual impact gospel singing creates on human hearts.” The men were then transported to the county jail in St. Catharines to await the arrival of the provincial sheriff who would take them to the federal prison in Kingston, Ontario. Upon arriving at the jail, they received unexpected kindness. The governor of the jail, Mr. Bush, was sympathetic to them and expressed regret that they needed to be jailed. In fact, Bush’s grandfather had been a Tunker preacher. In addition, Bishop S. F. Coffman was a personal friend of Bush’s. (Coffman lived nearby and visited E. J. several times during his time in jail.) The men were also happy to find 18 more conscientious objectors in the jail. Further, each of the COs were in cells in the same block, enabling them to worship, study the Bible, and sing hymns together in the large hallway. On the negative side, Garley Clinch, their 70-year-old guard, was hostile and mean towards the COs for their nonresistant stance and their Christian faith. Besides being verbally abusive, he stopped them from singing hymns when he was present and became angry when they prayed. The COs decided to privately pray for Clinch. Over the weeks, Clinch warmed to them, asking them to sing hymns, and to answer questions about the Bible. Sometime later, with the guidance of one of the COs, Clinch committed his life to Christ. 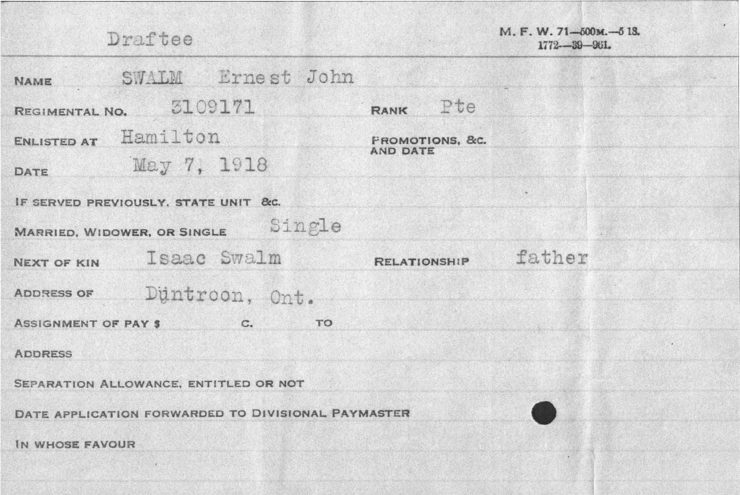 Thanks to the tireless efforts of S. F. Coffman and D. W. Heise, after four weeks in the St. Catharines jail, E. J. was paroled and told to report to military headquarters once a month.8 When the war ended four months later, E. J. was shocked to find that he had been honorably discharged. 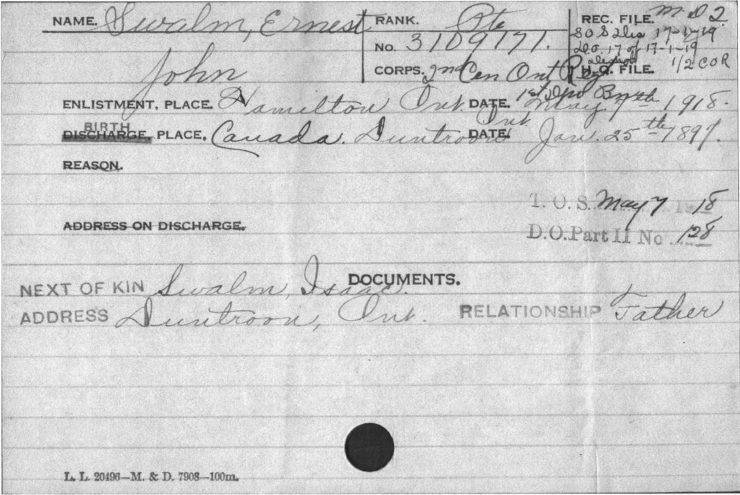 There are no references to conscientious objector status in E. J.’s draft or discharge papers. 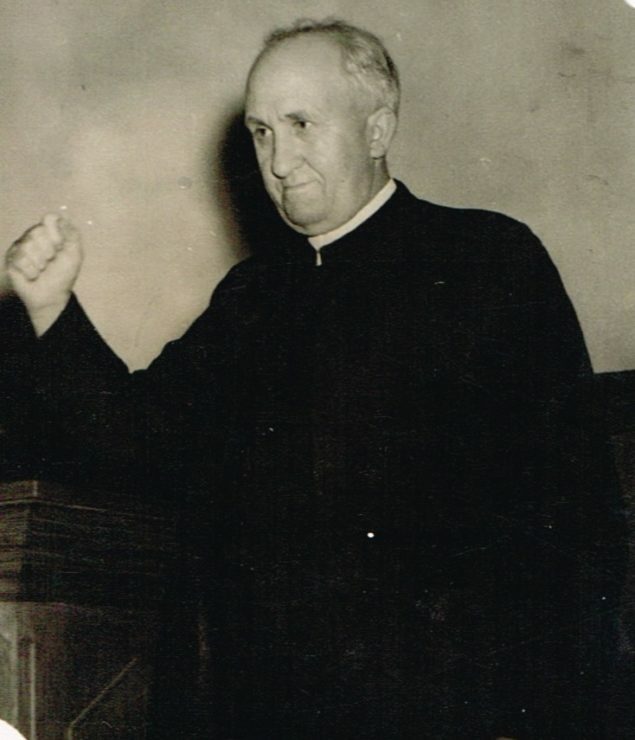 E. J. preaching, circa mid-1930s. Photo courtesy Brethren in Christ Historical Library and Archives. Looking back on E. J.’s life, it is clear that his World War I experience deeply impacted the future direction of his life.He himself said, “This unique experience to a great extent set the course for my life.”9 Along with becoming a Brethren in Christ pastor, a bishop, and a sought-after evangelist, he felt compelled to educate current and future generations about the “peace position” of the Brethren in Christ. To prepare himself, he earnestly studied the biblical doctrine of peace. E. J. also developed his public speaking skills; M. J. Heisey describes him as a “powerful orator and storyteller. . . .”10 His signature humor added to his appeal. E. J. drew large crowds when he told the story of his World War I experience and preached on nonresistance in Brethren in Christ and Mennonite churches, in multi-denominational peace conferences, in non-peace churches, and in other settings. 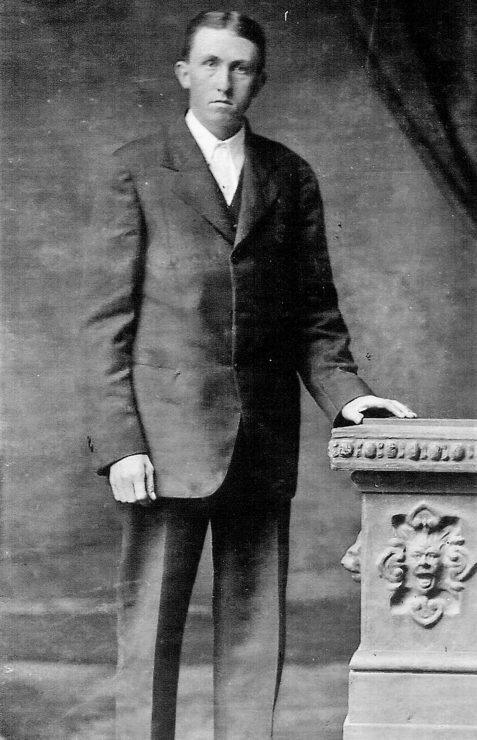 Howard Landis, one of Heisey’s questionnaire respondents, noted that one of the reasons Brethren in Christ churches in Pennsylvania were “packed out” was that “many Church of the Brethren and Mennonites [also] came to hear of Ernie’s pilgrimage relative to his stand in World War I.11 As of 1976, E. J. had publicly shared his story over 250 times.12 He also counseled draft-age men and teenage boys in small group settings and individually. 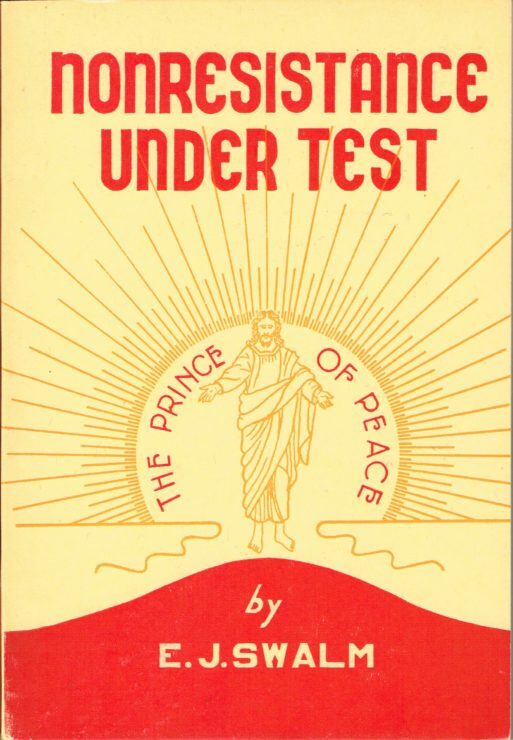 Cover of Nonresistance Under Test, by E. J. Swalm, first published in 1938. E. J. was also active in Brethren in Christ General Conference committees related to peace, such as the Peace, Relief, and Service Committee; and in Canadian Conference committees, such as the Ontario Brethren in Christ Nonresistance Committee. The latter was formed in 1938 by the General Conference and, like a similar American committee, was commissioned to contact government authorities to remind them of the denomination’s historic doctrine of nonresistance to war. The Committee was also authorized by the Canadian Brethren in Christ Joint Council, “to work with other non-resistant bodies in Canada in presenting their views.”14 E. J. was uniquely prepared to work with other nonresistant denominations. As previously noted, as a result of his World War I experience, E. J. was introduced early on to Mennonite leaders such as S. F. Coffman, and others. He had maintained these contacts. 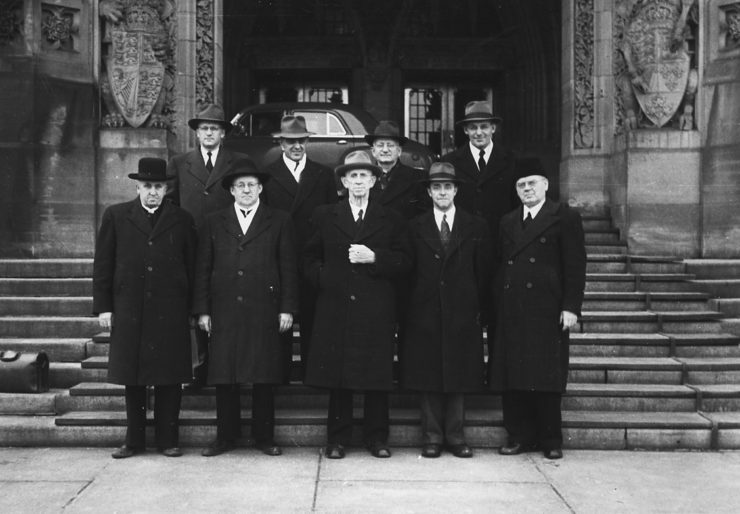 A 1951 delegation to Ottawa. Front row, left to right: E. J. Swalm, J. B. Martin, B. B. Janz, Fred Haslam, John G. Rempel. Back row, left to right: C. J. Rempel, Elven Shantz, David Reimer, David Schulz. Photo courtesy of Mennonite Archives of Ontario. E. J., like many of the other CHPC members, relied on income from the farm. However, given that he spent about 75 percent of his time doing peace work during the war years, it became impossible for him to fulfill his obligations for running the one hundred-acre farm. For a while his wife, Maggie, with the help of their hired man, John Patfield, ran the farm in E. J.’s absence. However, there came a time when John was drafted and no other men were available for hire. When their oldest daughter Lela graduated from high school, she began to help her mother with the farm work. Maggie and Lela did the bulk of the chores: feeding the animals, cleaning out the stables, milking and processing the milk, grinding grain, and birthing calves. Siblings Milly and Ray helped with daily chores when they were not in school. 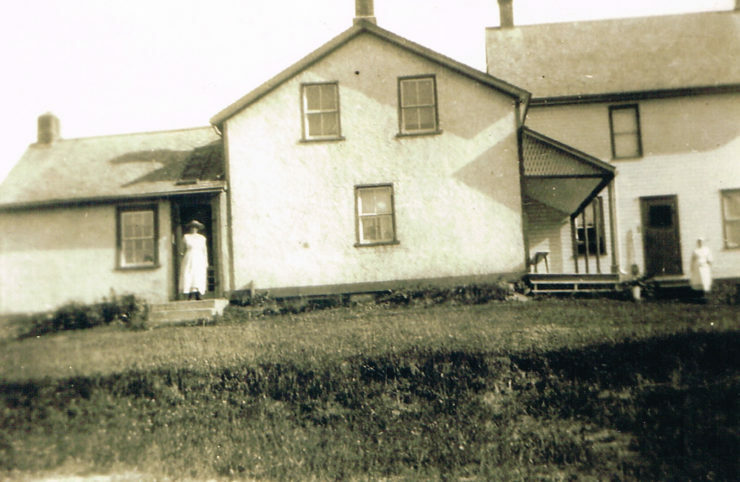 In the summer, Lela and Milly (then a young teenager) plowed fields and one year, roofed a tall barn. Another sister, Jean, helped with household chores. 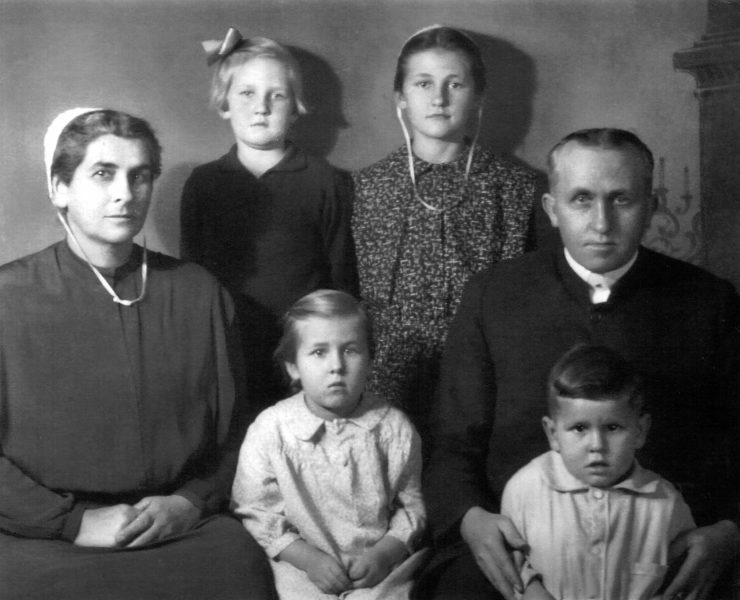 The E. J. and Maggie Swalm family, circa 1932. 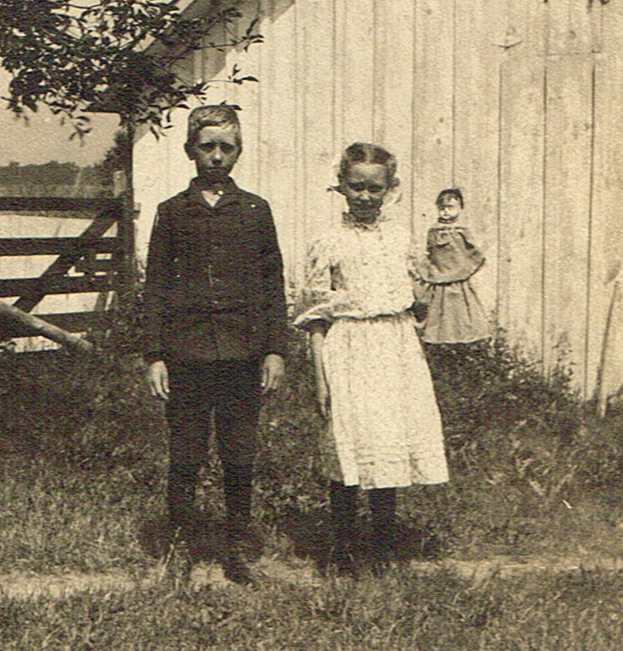 Children, front row: Mildred Swalm Hawes, Ray Swalm. Children, back row: Jean Swalm, Lela Hostetler Swalm. Photo courtesy of Brethren in Christ Historical Library and Archives. During the war years, Lela drove E. J. back and forth on his many trips to Kitchener, Ontario, in connection with CHPC business. She also typed his correspondence and notes. At the end of the war, six years after her high school graduation, Lela fulfilled her dream of attending Messiah College in Pennsylvania. In 1967, E. J. retired as bishop of the Brethren in Christ Canadian Conference and resigned from all major committees and organizations. However, he continued to preach and tell his story, and to influence young people. In 1970, a group of Messiah College students entered a float in the homecoming parade. It visually told E. J.’s World War I story. 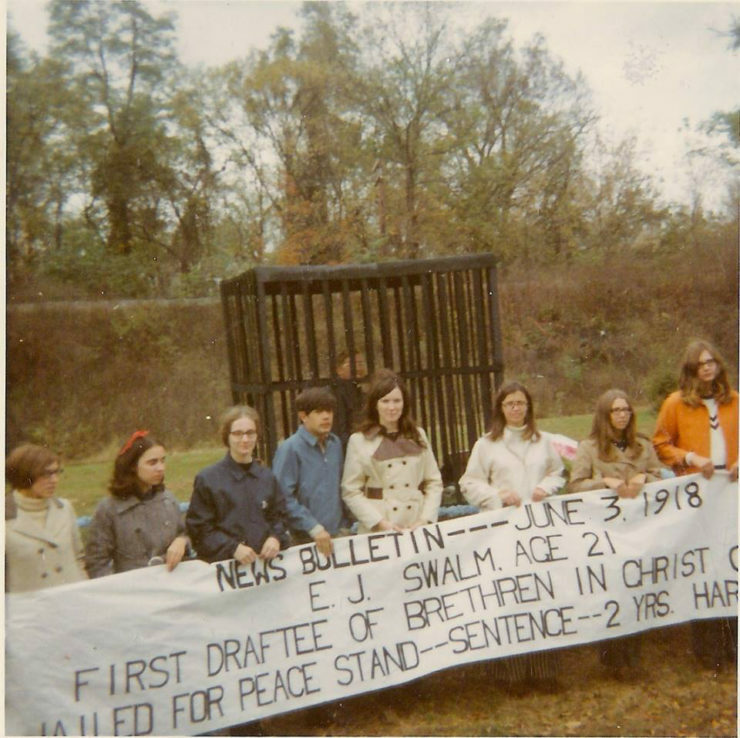 Messiah College Homecoming float in 1970 honoring E. J.’s World War I story. Photo courtesy of Shelley Frey Crider. For two more decades, E. J. continued to share his story. Pastors, young people, researchers, and others sought him out for counsel on peace and other issues and to hear his stories. These visits sometimes involved a day’s travel (or more) to the Swalm farm. 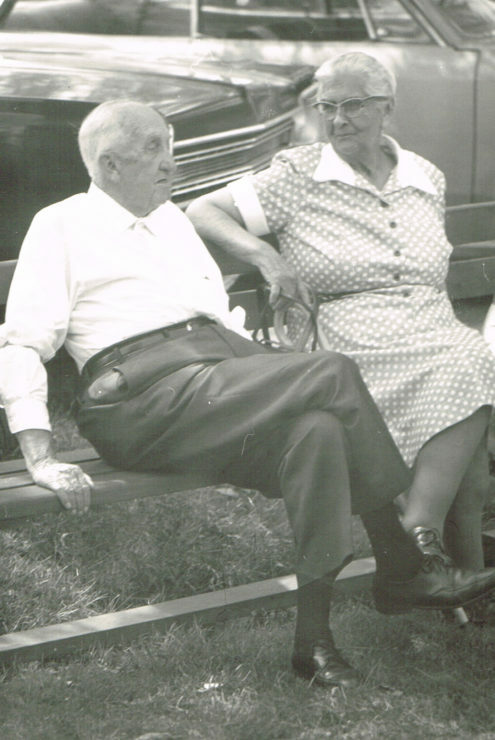 E. J. and Maggie in later years. Photo courtesy of Brethren in Christ Historical Library and Archives. Beth Hostetler Mark is librarian emeritus at Messiah College and attends the Grantham (PA) Brethren in Christ Church. She also serves as secretary pf the Brethren in Christ Historical Society. This article is adapted from a presentation she gave at the Lancaster (PA) Brethren in Christ Church in August 2018, during the Voices of Conscience exhibit tour. She is the granddaughter of E. J. Swalm. Read more articles by Beth Hostetler Mark.